This is a beautiful "Anya" dress by Karen Willis Holmes. I wanted a sparkly sequinned dress that was glamorous and yet simple and sophisticated, and saw this designer online. 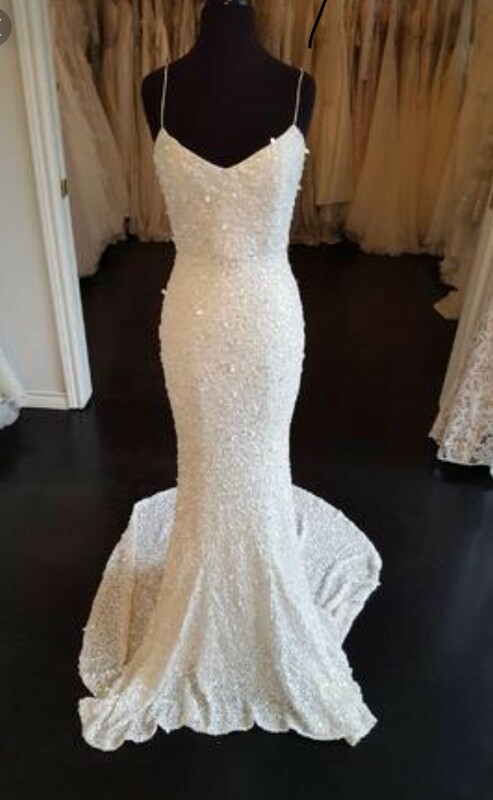 I tracked down the dress to a total of 8 stockists only in the UK (she is an Australian designer) and the dress cost me £2300 from a bridal boutique. I called all the other UK stockists and this was the best price I was quoted. The dress is handmade with beautiful detailed sequins, all individually sewn, and a hidden zip at the back, and satin straps. It easily works with a normal strapless bra. The train is beautiful and falls like a shimmering puddle on the floor, but can be bustled up. There is an optional sequinned belt which I wore to emphasise the waist. It is a UK size 12. The dress was only worn for a matter of about 4 hours for an evening event, indoors on carpets, so it's in great condition. I wore with a fur coat for Gatsby style winter wedding but it would also be fabulous for a summer wedding with more boho / floral accessories as I have seen online. KWH also sell accessories to match, like a over-skirt add on and detachable train, great if you're going from day to evening. The beauty of this dress is it's simple glamour which is so versatile and can be added to or kept minimal as you wish. I know everyone is supposed to say how nice the bride looks (! ), but people really did remark on the dress for weeks afterwards and I did feel really great and also comfortable as it is a nice quality fabric and supportive feel. Measurements: standard UK size 12: Bust 90cm Waist 75cm Length of dress from back fastening (just at the top of your back bra strap) to the floor, NOT including the train, 137cm.